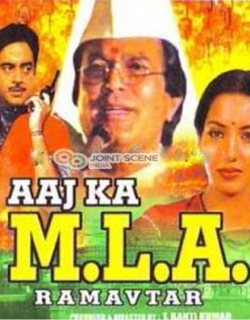 Aajkka M.L.A. Ram Avathaar is a 1984 Indian Bollywood action, costume drama film released on Mar 02, 1984. The film is directed by Dasari Narayana Rao, produced by Kranthi Kumar. There is a tie between a sitting M.L.A. Makhanlal and Ex-MLA Gauri Shankar for the choice of the party candidate for Kamalapur constitu- ency. The high command sends its own representative Tripathi to resol- ve the tie. He selects barbar Ram Avatar for the seat and is elected in due course. Both Makhanlal and Gauri Shankar try to dupe Ram Avatar but he soon gets the hung of politics and by intrigues becomes the C.M and in this capacity earns crores of rupees. His wife Sushama heckles him at a party-meeting when he resigns and reverts to his happy family life and profession. Check out this page for more updates on Aajkka M.L.A. Ram Avathaar. This page provides latest and updated information about Aajkka M.L.A. Ram Avathaar (1984) movie which released on Mar 02, 1984. Aajkka M.L.A. Ram Avathaar (1984) is directed by , produced by , starring .We have also provided 0 trailers and videos, 1 photos, 0 user reviews, and 0 critic reviews.You can review, like, dislike this movie and also can add to favorites. You can also find information on showtimes, CDs, DVDs, online rental, online free watching.